After only two months since the conclusion of their Token Sale, the VIBEHub team is making major moves with long term implications for the AR/VR industry. VIBEHub has formally announced that they will be working with global tech giant Monster Inc and their new division Monster Technologies. Monster is a global electronics conglomerate that has been a key innovator of electronic hardware in the tech industry for over 40 years. With yearly sales revenue in the billions, offices located globally, a workforce numbering over six hundred and one of the original architects of the Beats by Dr.Dre line, Monster is positioned to be a leading entity for years to come. Monster, a global behemoth, teaming up with VIBEHub, an AR/VR startup may surprise some but for many in the tech industry this is conventional thinking. This move confirms what many industry insiders have already concluded, that Monster is willing to embrace and invest in the coming virtual and augmented reality revolution by joining forces with companies like VIBEHub. Monster is looking to expand into AR/VR with the VIBEHub team, whom have released several exciting beta versions on its platform accompanied with YouTube demo videos and they already have an established AR/VR platform with global subscribers. Monster has great relationships with several great mainstream artists such as Joe Perry of Aerosmith, Rae Sremmurd, and Yo Gotti just to name a few. This partnership is not only great news for both companies but also for the mixed reality consumer market as it strives for mass adoption. 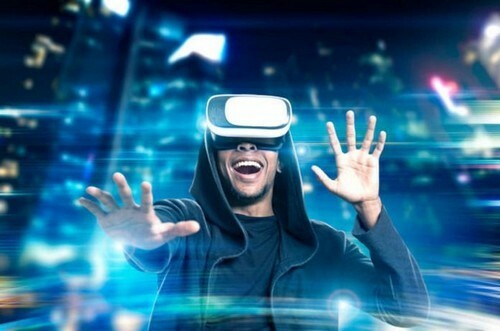 VIBEHub is also hinting at capturing photorealistic holograms of mainstream artists in elaborate virtual environments and allowing VIBE token holders to enjoy the performances on the platform by years end. When we discuss Volumetric video it is important to distinguish this from 360 video, which places the user in a static position with freedom limited to moving their head but lacking the overall ability to change position while also lacking comparable depth. On the contrary, Volumetric video captures every angle of the subject allowing the user to interact with the photorealistic hologram. It also allows VIBEHub to manipulate the objects by scaling, rotating or placing them in exotic locations. VIBEHub plans to use these captures and create experiences in AR/VR as well as conventional laptops and mobile tablet devices. The VIBEHub team has posted pictures inside the 8i studio with large captions indicating a pending announcement. 8i is a Los Angeles based production company solely focused on bringing volumetric video technology to the masses. They are heavily backed by Ashton Kutcher and some of the biggest venture capital firms in Silicon Valley. Google, coincidentally also hired 8i earlier this year to build an Augmented Reality (AR) app for them. VIBEHub will also be releasing their own custom “lightning” like off-chain solution to facilitate instantaneous atomic transactions, without any gas fees while performing micro-transactions on the VIBEHub platform using the VIBE token by the years end. This is a major milestone in development as it is essential to create a seamless user experience with the various devices without the need of a special plug in or the requirement to run a local node yourself. Many believe AR/VR technology is the future and VIBEHub has certainly strategically placed themselves to be a key player for a long time. VIBEHub is currently trading on HitBTC and Etherdelta under the ticker VIBE. The website for VIBEHub is vibehub.io, where you can see what the VIBE is all about.